For maximising space, there are no better outdoor umbrellas than the SU3 Wall Mounted Umbrella from Ashadya, Sydney’s premiere outdoor umbrella specialists. We offer high-quality, commercial-grade umbrellas in Sydney and the SU3 Umbrella is no exception. The unique difference with the SU3 Umbrella is that it can be easily mounted to almost any surface using a simple upper and lower bracket. These brackets can be purchased individually allowing the umbrella to be used in multiple locations. The SU3 Umbrella can be successfully installed in almost any environment. The SU3 Umbrella is available in a range of colours to complement your home and will suitably blend into and enhance any setting. If you are looking for a unique shade solution for an area of your home with limited space, then a wall mounted umbrella may just be the solution for you. 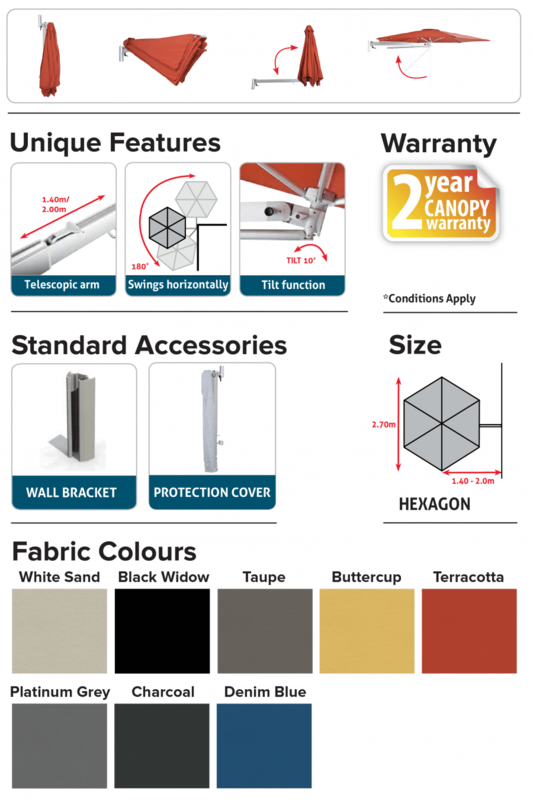 To find out more information on the SU3 Wall Mounted Umbrella, or any of the umbrellas in our outdoor umbrella range, get in touch with one of Sydney’s leading outdoor umbrella suppliers today. Call our friendly team on 1300 570 901.